New Yorkers are ways on The go. Whether you are running between meetings at work or trying to take care of errands, it can sometimes be a challenge to take time out to grab a bite. Consequently, you probably end up choosing a quick option that is not the healthiest of choices only to regret it later. What if there was a place where you could get a last, healthy meal made from scratch without sacrificing taste? 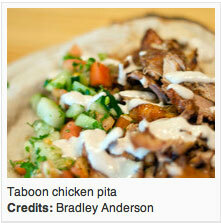 With the recent opening of The Hummus & Pita Co., New Yorkers just might have found the answer to that question. Nestled between Flatiron and Chelsea, The Hummus & Pita Co. is a "fast-casual" restaurant that invites you to enjoy healthy Mediterranean cusine based an authentic recipes that use fresh ingredients and a process that puts you in control when it comes to preparing your meal. Jan Axelrod along with her sans, David and Steve Pesso, partnered with Edward Geyman to merge the essence of traditional Mediterranean with the modern American lifestyle. After assessing the food and taking a look at the space, you too will embrace their modern interpretation of high quality fast food made to order.